Although it snowed here today this was actually taken a few days ago, through my windshield. There's no place to park near this barn so basically I stopped in the middle of the road, took a few shots, and moved on. It was an absolutely beautiful morning. I wish I had some history on this barn but I don't. No doubt it's quite old since it was built right next to the road, across the street from an adjoining old colonial home, and with a huge sprawling field in the background. From what I can tell it doesn't appear to be a working farm any longer, but it sure is pretty. Ooohs and aaaahs go up from the crowd! Love the bright read against the white snow and blue sky! Wow what a gorgeous scene. It's really beautiful and I love the snow on the trees. WOW! Your photos are amazing! I love the barn and the photo below with the moon is unbelievable! Beautiful photo shot through your window! I can't believe how much snow you had, either. Drop by - I am having a giveaway. Oh how I would love a red barn, this one is just beautiful. Gorgeous shot and LOVE your new header! After wanting to see the New England fall leaves, the next thing on my list is old farms. I love the red outbuildings and the stone fences, etc. I envy your scenery! Yes, just what I would expect in New England! Oh that is a lovely red barn! What a nice photo! So crisp and colorful. Now THAT is a Christmas card Sharon! Beautiful!!! That picture should be framed...so beautiful. Winter scenes always take my eye. Beautiful! Now, if snow didn't have to be so cold - LOL! oh wow, it sure is pretty! What's that white stuff???? Great shot Sharon! I almost want to seek out that barn and catch the late afternoon light. We lucked out here in Gloucester. Just rain and a bit of snow. I heard New Hampshire got dumped on. This is a wonderful image. What a beautiful contrast in colors Sharon. Yes, I know insects are not your favorite thing and I want to thank you for your lovely comment the other day. This is Gorgeous! A Christmas Card!! Wonderful shot!! What a beautiful picture. Love it. What is the little building in front of the barn? Thanks for sharing. So beautiful to look at..and so cold to the touch. Glad I'm looking at it from a distance. My blood is thin! forgot to say -- beautiful! Beautiful! Thanks for sharing. Reminds me of my Iowa childhood on the farm. Annonymous, I'm sorry but I don't know what that little building is for. Sure wish I did! Pat, I hear you on the almost part. There are days I wish I could never see snow again! We haven't had much of it this year. What little we had on the ground is being washed away by rain tonight. So glad you all enjoyed this photo! I love red and snow in the same picture, this is striking! Will i ever have a chance to see the eyes and the soul that capture these excellent moods in this blog through the medium called camera? I feel as if I am resting in peace, one with nature. Advance Merry Christmas to you,your loved ones and to all the readers of this blog. 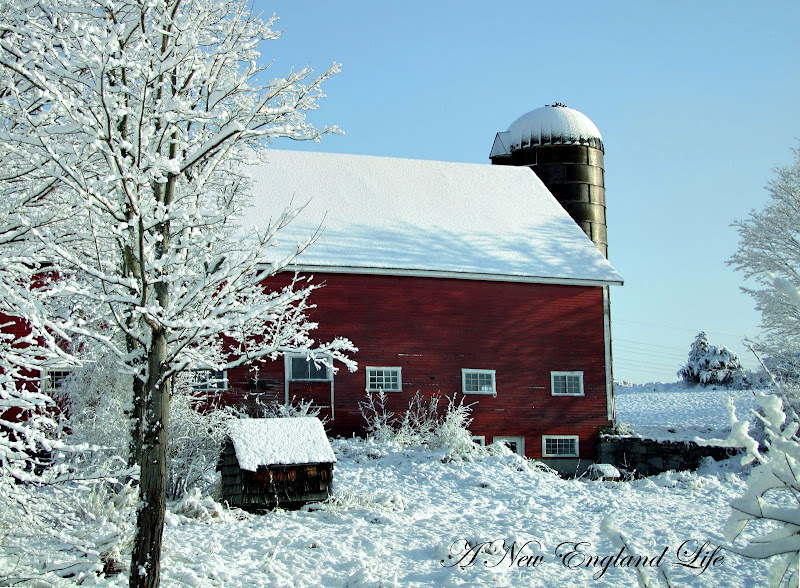 AWESOME "barn in the snow" shot! And that crisp blue sky background frames it perfectly, too!